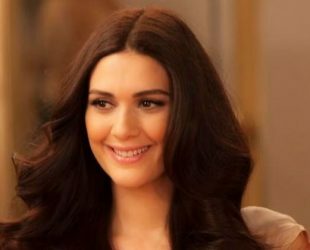 Bergüzar Korel was born in 1982 in Istanbul, Turkey. Graduated from the Theatre Department of Mimar Sinan State Conservatory. She acted in many plays and short films during her school life. Bergüzar Korel made her debut as Leyla in Kurtlar Vadisi Irak (Valley of the Wolves: Iraq). Bergüzar took to wide attention after starring as Şehrazat Evliyaoğlu in Binbir Gece serie. Later, she appeared in Magnificent Century as a guest role of Monica Teresse for one episode in 2012. Korel starred as Feride Şadoğlu alongside Kenan İmirzalıoğlu in the popular series Karadayı. Korel is the daughter of actor Tanju Korel who of Circassian descent and actress Hülya Darcan. In August 2009, Korel married with actor Halit Ergenç, who was her partner in Binbir Gece TV show.